Unicorn Air Freshener I think this would just be a cute little gift to go with other gifts as who doesn't want a unicorn air freshener in their car!? It also smells of Vanilla which is a scent you really cannot go wrong with, did I mention it's a unicorn. Metal Floral Hanging Heart Decoration I don't think anyone can ever have too many little decorations like this around their house, they just look really pretty when displayed. This one is gorgeous featuring a lovely floral pattern all over. Lush 'Mum' Giftset You can never go wrong with something from Lush. This little giftset contains 6 different products, perfect for helping your Mum have a pamper evening. The set includes the Yummy Mummy showergel, Honey I Washed The Kids soap, The Comforter bubble bar, Blackberry bathbomb, Vanilla Dee-lite body lotion and Yummy Mummy body conditioner. Bulldog Jewellery Holder A perfect gift for any Dog lovers. This adorable little Bulldog can sit on a dresser and not only look pretty with it's golden wings but can also hold your jewellery. Perfect for keeping it all in a safe place! Normal Family Plaque A gift thats a bit of fun and when you read it you will probably nod your head in agreement. Perfect for anybody who loves to have a giggle. White Musk Eau De Toilette This is actually one of the gifts I bought my Mum and my best friend bought her Mum one too! It's such a gorgeous scent and my Mum has been constantly raving on about how she loves the scent and about how she used to wear it when she was my age! Everybody loves a good perfume right!? Ikea Flowers Flowers are always a big thing for Mothers Day however these gorgeous artificial ones will last all year around! They come in a huge range of flowers and are so cheap..I'll take ten! Plant Pot Everybody and their Mother probably already own a number of these little pots but if not they really are such a gorgeous little item to have. Whether you use them for flowers or makeup brushes they just look really pretty on display. 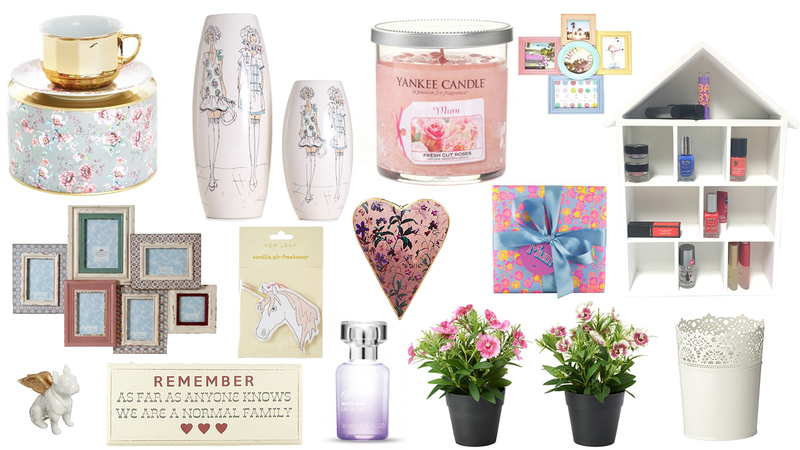 Have you got all your Mothers Day gifts yet?